One about salads, although not very much typical or well known. 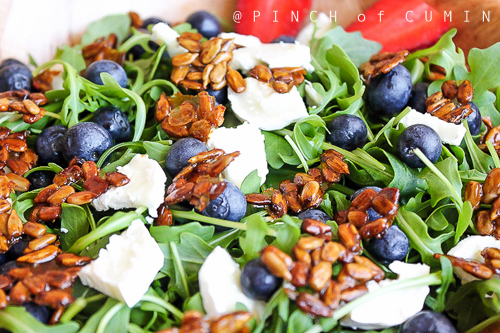 Arugula on its own, yes, goat cheese also, blueberries of course, and sunflower seeds, also yes. But together? It surprises, but yes, its taste is extraordinary and strawberry vinaigrette provides the touch that it was missing. But anyways, sunflower seeds as they are would not say that much. The trick of this recipe is their caramelization, and they are such good that you will not resist to have a few as a snack before salad comes to the table. It does not matter, so that your back is covered, make a few more and enjoy while you assembly the salad. First of all, you need to caramelize sunflower seeds, and for that purpose we are going to use the oven. You can start by preheating it to 190ºC for around 5 minutes (do not forget to take out the tray in advance). The most important thing is that the butter is melted, so if you do not have it melted yet, heat it for a few seconds in the microwave or in a saucepan to low heat. Once you have it melted, mix it with olive oil, honey and stir it until homogeneous. Add sunflower seeds and stir it until all of them are impregnated with the mixture. Put sulfure paper on top of the tray and spread sunflower seeds in little mountains, in a way that they are well spread over the tray. Bake them for a maximum of 10 minutes (pay attention, otherwise they will get burnt) and when you take them out, sprinkle them with marine salt. Let them rest in the tray until they retrieve room temperature. Now we go with the vinaigrette. First. mix mustard with jam, and when it is homogeneous, add oil and later, rice vinegar. Season with salt and pepper. And finally, the assembly, which does not have any mystery. Put first arugula, and then add in this order: blackberries, goat cheese slices (previously chopped into cubes). 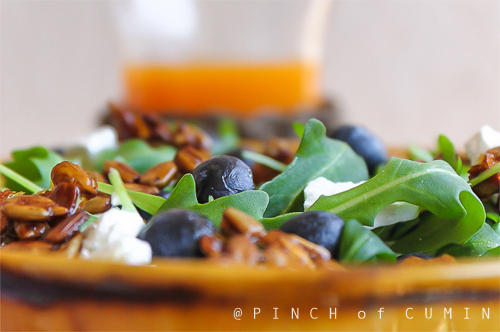 Sprinkle caramelized sunflower seeds and season it with the vinaigrette. You can eat caramelized sunflower seeds as a snack in between meals, they are great. You can decorate with strawberries or add strawberry pieces as an additional ingredient. 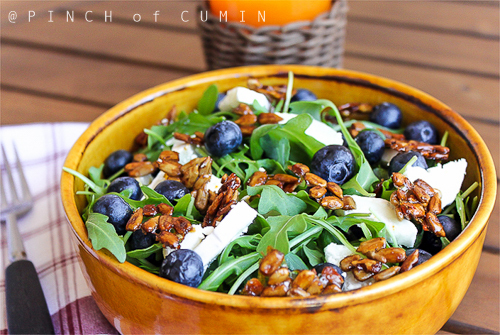 One Comment to "Arugula & blueberries salad with caramelized sunflower seeds"